"There is this misconception that one needs to have money before getting married. But the truth is, getting married will help a couple to be more focused in their goals and careers and thus it will increase their ability to earn better wages." 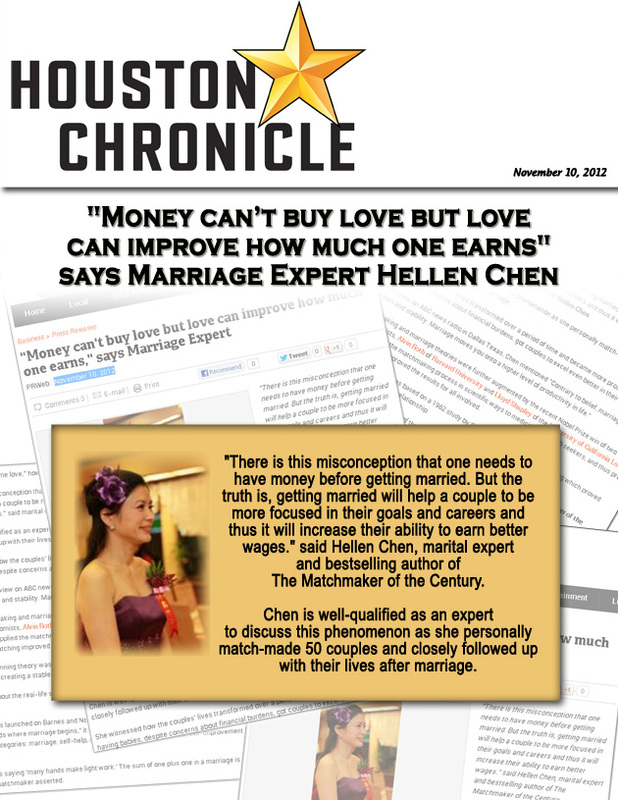 said Hellen Chen, marital expert and bestselling author of The Matchmaker of the Century. According to the latest 2012 population report by US Census Bureau, married men between age 18-64 are higher paid in salary ($55,958 median income) than single men ($34,634). This report also showed married women earning more wages than single women. As the famous Beatles songs goes, "Money can't buy me love," however, it seems love can be a factor to increase one's income. "There is this misconception that one needs to have money before getting married. But the truth is, getting married will help a couple to be more focused in their goals and careers and thus it will increase their ability to earn better wages." 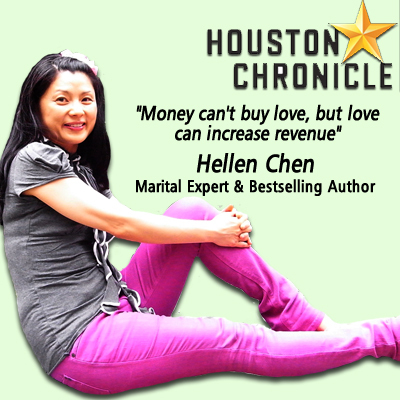 said marital expert and bestselling author Hellen Chen. Chen is well-qualified as an expert to discuss this phenomenon as she personally match-made 50 couples and closely followed up with their lives after marriage. She witnessed how the couples' lives transformed over a period of time and became more prosperous and how having babies, despite concerns about financial burdens, got couples to excel even better in their careers. In a recent interview on ABC news radio in Dallas Texas, Chen mentioned "Contrary to belief, marriage gives a person freedom and stability. Marriage moves you onto a higher level of productivity in life." 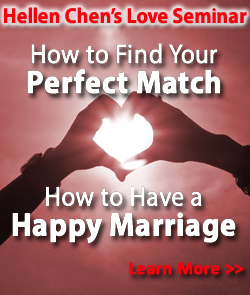 Chen's matchmaking and marriage theories were further augmented by the recent Nobel Prize win of two American economists, Alvin Roth of Harvard University and Lloyd Shapley of the University of California Los Angeles, who applied the matchmaking process in scientific ways to medicine and to job seekers, and thus prove that correct matching improved the results for all involved. This award-winning theory was based on a 1962 study by Shapley on traditional matchmaking which proved workability on creating a stable relationship. 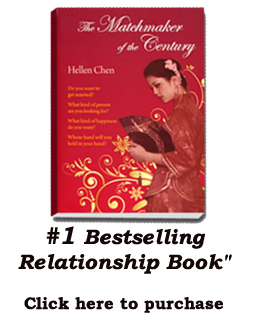 Chen wrote about the real-life stories of the couples she match-made in her book, "The Matchmaker of the Century." This book was launched on Barnes and Noble in October and while debunking many marriage myths such as "romance ends where marriage begins," it struck a chord with readers and subsequently achieved #1 bestselling status in 6 categories: marriage, self-help, relationships, love and romance, self-improvement and parenting and family. "There is this saying 'many hands make light work.' The sum of one plus one in a marriage is not two but infinity!" the ardent matchmaker asserted.